Air pollution is a major environmental risk to health and is estimated to cause approximately 2 million premature deaths worldwide per year. Air pollution is an outdoor as well as an indoor problem. In fact, indoor air pollution levels can even be higher than the outdoor levels. Indoor air contains outdoor air pollutants, the levels varying depending on building characteristics. In addition to outdoor pollutants, secondhand tobacco smoke is one of the main sources of indoor air pollution. Secondhand smoke is a mixture of exhaled mainstream smoke and sidestream smoke released from a smoldering cigarette or other smoking device (cigar, pipe, bidi, etc.). Scientific evidence available for more than two decades convincingly demonstrates that the exposure to secondhand smoke harms health and worsens existing health problems among non-smokers. The adverse effects of secondhand smoke are both immediate and long term, and are felt by both children and adults. Secondhand smoke is a preventable public health hazard. Policies requiring smoke-free environments are the most effective method of reducing SHS exposure. In India, prohibition of smoking in public places is mandated under section 4 of the Cigarettes and Other Tobacco Products Act (which includes prohibition of advertisement and regulation of trade and commerce, production, supply and distribution) of 2003. As defined under 3(l) of COTPA "public place" means any place to which the public have access, whether as of right or not, but does not include any open space. In addition, smoking is also prohibited at the open spaces that are visited by the public, like open auditoriums, stadiums, railway stations, bus stops and other such places. The exception to this provision is that hotels with more than 30 rooms and restaurants with more than 30 seats are allowed to have a smoking area or space. Airports are also an exception to this rule as they are also allowed to have a separate smoking zone. "Smoking area or space" is not provided at the entrance or exit of a restaurant, hotel or airport. "Smoking area" is used only for the purposes of smoking and no service(s) are allowed therein. Detailed rules prohibiting smoking in public places were notified on 30 th May 2008 and came into force on 2 nd October 2008. A study was conducted to assess the implementation of smoke-free policies and its impact on indoor air quality in the city of Mumbai. Restaurant - premises which is carried on principally or wholly the business of supplying meals or refreshments to the public or a class of the public for consumption on the premises. Bar - premises which is carried on principally or wholly the business of supplying alcoholic beverages (beer, wine, whisky and cocktails, etc.) and food to the public or a class of the public for consumption on the premises. Country liquor bar - premises which is carried on principally or wholly the business of supplying locally made alcoholic beverages (fenny, toddy, etc.) to the public or a class of the public for consumption on the premises. These establishments are usually run-down and feature a clientele of mainly the working class people. Pub - a pub is an entertainment venue with recorded music played by disc jockeys and there is a provision of a back bar. Pubs in India may or may not have dancing floors. Hookah restaurant - the hookah restaurant is an establishment where patrons share shisha (flavored tobacco) from a communal hookah that is placed at each table. RSP concentrations were measured by using a "SIDEPAK™ AM510 Personal Aerosol Monitor" in the survey mode. The SidePak uses a pump to draw air inside to measure the real-time concentration of air particles in milligrams per cubic meter. PM 2.5 is a non-specific marker for SHS exposure as there may be other sources of PM 2.5 . The SidePak was zeroed prior to each use by attaching a high-efficiency particulate air (HEPA) filter according to the manufacturer's specification. Air sampling was carried out any time between 6:30 PM to 11:00 PM for a minimum of 60 min at each venue. The field investigator seated himself in the central area of the venue and away from open doors, windows and kitchen entry and conducted observational monitoring, such as surveying rooms for the posting of "No Smoking" signs and ash trays on tables. The monitor was placed in a central location on a table near the height at which a person breathes air. Entry and exit time for each venue were noted by the investigator. The investigators also interacted with managers, owners and waiters to assess the implementation of smoke-free policies. Data recorded in the SidePak monitor at each venue were downloaded to a computer with the help of "TSI Trackpro data analysis software, version 3.41." In accordance with the Global Air Monitoring Study Protocol, a calibration factor of 0.32, which is suitable for the contribution of secondhand tobacco smoke, was applied to all data. Average concentration (mean), median and coefficient of variation of PM2.5 (μg/m 3 ) levels were calculated separately for each venue. For describing air quality, guidelines developed by the US Environmental Protection Agency (EPA) were used. The Air Quality Index (AQI) ranged from 0 to 500, with a higher value indicating a greater level of air pollution and, therefore, greater health concern. All statistical analyses were performed using SPSS software. A total of 50 venues were selected for the study, including five restaurants, four pubs, 27 bars and restaurants, 10 country liquor bars and four hookah restaurants (N = 50). One measurement session was carried out per venue. At the time of observational monitoring of the total 50 venues, smoking within premises was observed in 18 of the venues [Table 1]. 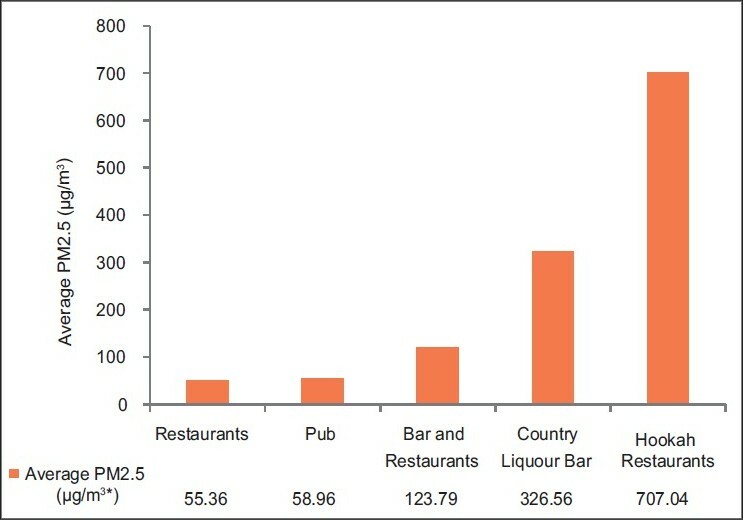 There was no smoking observed in all five restaurants and four pubs, while smoking was observed in seven of 27 bars. The venue with the highest proportion of smoking observed was country liquor bars (eight out of 10). In addition, the "No Smoking" signage was seen at 33 venues, of which four were in Marathi and two in Hindi, commonly spoken languages in Mumbai, while the remaining signages were in English. [Table 2] shows the respective average PM 2.5 (μg/m 3 ) concentrations in the different hospitality venues included in the study. Overall, the PM 2.5 levels ranged from 16.97 to 1101.76 μg/m 3 . The lowest average PM 2.5 (μg/m 3 ) level was observed in restaurants (55.36 μg/m 3 ) and the highest average level was observed in hookah restaurants (707.04 μg/m 3 ) [Figure 1]. The average PM 2.5 level was also higher in venues where smoking was observed (363.04 μg/m 3 ) compared with venues where smoking was not observed (97.19 μg/m 3 ) [Figure 2]. [Table 3] shows the AQI of all the venues in the study. Each category corresponds to a different level of health concern. The average PM 2.5 levels at restaurants and bars were categorized as "moderate level" of health concern. 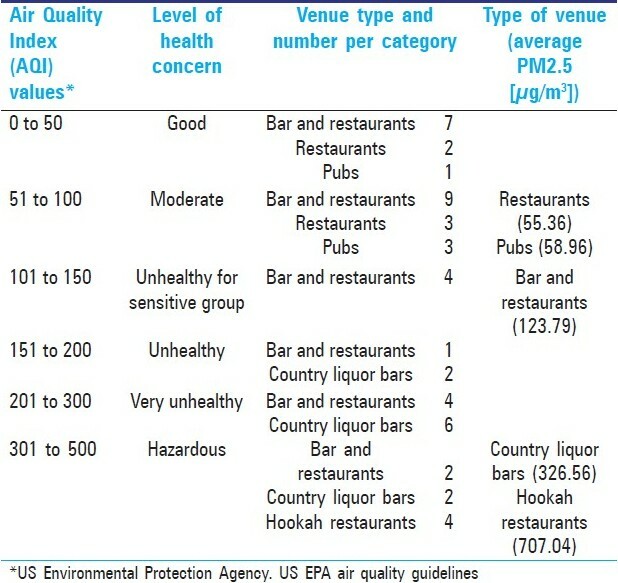 Country liquor bars and hookah restaurants however had average PM 2.5 levels falling under the category of "hazardous level" of health concern. According to air quality guidelines of the US Environmental Protection Agency,  an AQI value for PM 2.5 particles level between 0 and 50 is considered satisfactory, and air pollution at this level poses little or no health risk. In the present study, 20% of the venues fell under the "good" category [Table 3]. A "moderate" category (PM 2.5 particle level between 51 and 100) indicates that air quality is acceptable. However, for some pollutants, there may still be a moderate health concern for a small number of people. In the present study, 15 (30%) venues were in this category, including nine bars, three restaurants (average PM 2.5 levels of 55.36 μg/m 3 ) and three pubs (average 58.96 μg/m 3 ). Average PM 2.5 levels of all 27 bars (123.79 μg/m 3 ) fell under the category of "unhealthy for sensitive groups." Air quality was worse in 10 country liquor bars (average 326.56 μg/m 3 ) and worst in four hookah restaurants (average 707.04 μg/m 3 ). The level of pollution in these venues fell under the category of "hazardous" to health (levels between 301 and 500) or higher, which has the potential to trigger emergency health conditions. When these results were getting analyzed, a news about air quality at garbage dumping grounds created a lot of agitation in Mumbai. The average level of PM 2.5 (μg/m 3 ) particles in the air of the dumping ground area in one area (Sudha Park at Ghatkopar) was 148.5 μg/m 3 and 169.5 μg/m 3 at another area (Shivaji Nagar, Deonar). Air quality at indoor public places where smoking was observed in this study was far worse than that at the garbage dumping grounds. 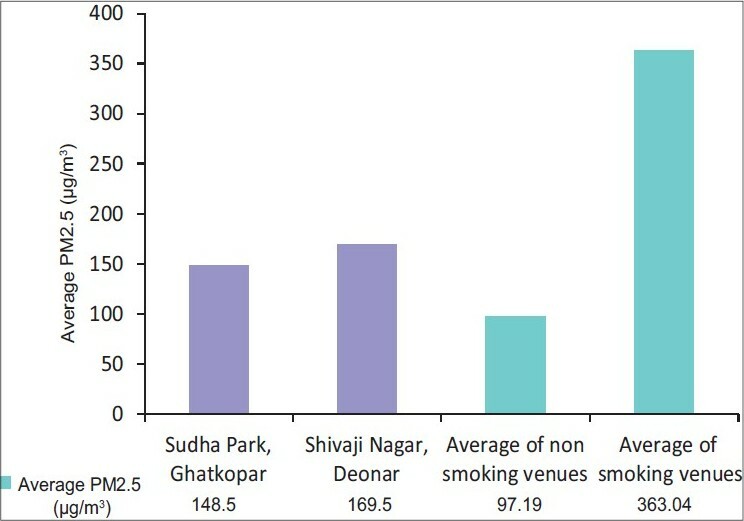 The average level of PM 2.5 (μg/m 3 ) particles in all the venues where smoking was seen despite the ban was 363.04 μg/m 3 , which was much higher than the levels found at both the dumping grounds in Mumbai [Figure 2]. Increased levels of PM 2.5 (μg/m 3 ) in these smoking areas are also harmful to the health of the customers at these venues. A recent cross-sectional study in China reported that PM 2.5 levels were much higher at bars and restaurants where smoking was observed (208 μg/m 3 ) than where smoking was not observed (99 μg/m 3 ). The values observed in this China study were similar to those found in our study for venues where smoking was not observed (97.19 μg/m 3 ), but were higher in our study for venues where smoking was observed (363.04 μg/m 3 ). We also found much higher levels among country liquor bars and hookah restaurants. A study reported from Ireland showed that there was a dramatic change in the air quality of bars/pubs after the national level comprehensive workplace smoke-free law was implemented in March 2004. As a result of this law, smoking at bars/pubs in Ireland went down from 98% to 5%, but remained nearly unchanged in the UK (98-97%), where the law was not in effect. In our study, smoking was not observed in any of the restaurants and pubs at the time of data collection, which suggests that the 2008 ban in India has been effective in these venues. Secondhand smoke is a preventable public health hazard. Because there are no safe levels of secondhand smoke, it is important that smoke-free environment policies be as strong as possible. The objective of the smoke-free policy is to protect non-smokers from exposure to secondhand smoke, thereby enhancing the air quality of the living environment. Although some people know that they are harming their self by smoking, they may not be aware of the negative effects on the people around them. Many people who smoke say that restricting smoking in public would be taking away their freedom but, in reality, smoking in public takes away non-smokers' right to breathe fresh air. The most serious problem with smoking in public is the negative effects it has on children. Children are the future; therefore, instead of polluting their bodies, we should be doing everything we can to keep them healthy. Exposure to secondhand smoke is an entirely preventable cause of significant morbidity and mortality associated with tobacco use. Smoke-free public places not only protect non-smokers from the dangers of passive smoking but also encourage smokers to quit or reduce consumption and children not to take up the habit. For smoking bans to succeed, enthusiastic endorsement by and active participation of the community and an awareness of the health consequences of exposure to secondhand smoke are needed. Our study clearly demonstrated that the average PM 2.5 level was highest at hospitality venues where smoking was observed compared with those where smoking was not observed, and was especially high in hookah restaurants and country liquor bars. Considerable scope for improvement in implementation of smoke-free policies exists. We would like to acknowledge the Roswell Park Cancer Institute for funding and technical support. We would like to thank field investigator, Mr. Dinesh Y Kashid for data collection and Ms. Genevieve Sansone for proof reading of the manuscript. 1. World Health Organization. Air quality and health [Online]. WHO Media Centre; August 2008. Available from: http://www.who.int/mediacentre/factsheets/fs313/en/index.html. [Last cited on 2009 Dec 15]. 2. World Health Organization. Second hand tobacco smoke. WHO; 2010. Available from: http://www.who.int/tobacco/research/secondhand_smoke/en/. [Last cited on 2009 Dec 15]. 3. Tobacco-Free Initiative Unit, WHO South-East Asia Region. Effective implementation of the WHO Framework Convention on Tobacco Control through MPOWER policy package: Towards a smoke-free region [Internet newsletter]. World Health Organization; 2009. Available from: http://www.searo.who.int/LinkFiles/Tobacco_Free_Initiative_tfi_newsletter-_vol_2_no._1.pdf. [Last cited on 2009 Dec 15]. 4. Connolly GN, Carpenter C, Alpert HR, Skeer M, Travers MJ. Evaluation of the Massachusetts Smoke-free Workplace Law. UC San Francisco: Center for Tobacco Control Research and Education; 2005. Available from: http://escholarship.org/uc/item/1zw4x02j. [Last cited on 2009 Dec 15]. 5. Matt GE, Bernert JT, Hovell MF. Measuring secondhand smoke exposure in children: An ecological measurement approach. J Pediatr Psychol 2008;33:156-75. 6. Travers MJ, Cummings MJ, Hyland A, Repace J, Babb S, Pechacek T, et al. Centers for Disease Control and Prevention (CDC). Indoor air quality in hospitality venues before and after implementation of a clean indoor air law - Western New York, 2003. MMWR Morb Mortal Weekly Report 2000;53:1038-1041. 7. Centers for Disease Control. Reducing tobacco use: A report of the Surgeon General. Atlanta, GA: US Department of Health and Human Services, CDC; 2000. 8. Ministry of Law and Justice, Government of India. The Cigarettes and Other Tobacco Products (Prohibition of Advertisement and Regulation of Trade and Commerce, Production, Supply and Distribution) Act, 2003. 9. Trust Science Innovation Incorporated. SIDEPAK™ AM510 Personal Aerosol Monitor [Online], 2010. Available from: http://www.tsi.com/en-1033/products/2112/sidepak™_am510_personal_aerosol_monitor.aspx. [Last cited on 2010 Dec 15]. 10. TSI Incorporated. Model AM510 SIDEPAKTM Personal Aerosol Monitor, User Guide and theory of application. Shoreview, MN, USA: TSI Incorporated; 2006 Jun. 1980456, Revision E.
11. Hyland A, Travers MJ, Dresler C, Higbee C, Cummings MJ, Carpenter C, Connolly GN. A 24-Country comparison of levels of indoor air pollution in different workplaces [Internet]. Roswell Park Cancer Institute, International Agency for Research on Cancer, Harvard School of Public Health; 2006. Available from: http://www.tobaccofreeair.org/downloads/GAMS%20report_7_7_06.pdf. [Last cited on 2009 Dec 15]. 12. US Environmental Protection Agency. US EPA air quality guidelines [Internet], 2009. Available from: http://airnow.gov/index.cfm?action=aqibroch.index. [Last cited on 2009 Dec 15]. 13. Deonar dump′s toxicity makes high court fume. The Times of India, 2009 May 7. 14. Liu RL, Yang Y, Travers MJ, Fong GT, O′Connor RJ, Hyland A, Li L, Nan Y, Feng GZ, Li Q, Jiang Y. A cross sectional study on levels of secondhand smoke in restaurants and bars in five cities in China. Tob Control 2010;19 Suppl 2:i24-9. 15. Fong GT, Hyland A, Borland R, Hammond D, Hastings G, McNeill A, et al. Reductions in tobacco smoke pollution and increases in support for smoke-free public places following the implementation of comprehensive smoke-free workplace legislation in the Republic of Ireland: Findings from the ITC Ireland/UK Survey. Tob Control 2006;15 Suppl 3:iii51-8.